Theresa May refused to publish the complete legal analysis of the agreement she signed. Leaked analysis proves she lied. On November 26, Trump proclaimed the Brexit Agreement ‘Sounds Like a Great Deal for the EU’. “I think we have to take a look at seriously whether or not the U.K. is allowed to trade. Because, you know, right now if you look at the deal, they may not be able to trade with us and that wouldn’t be a good thing." 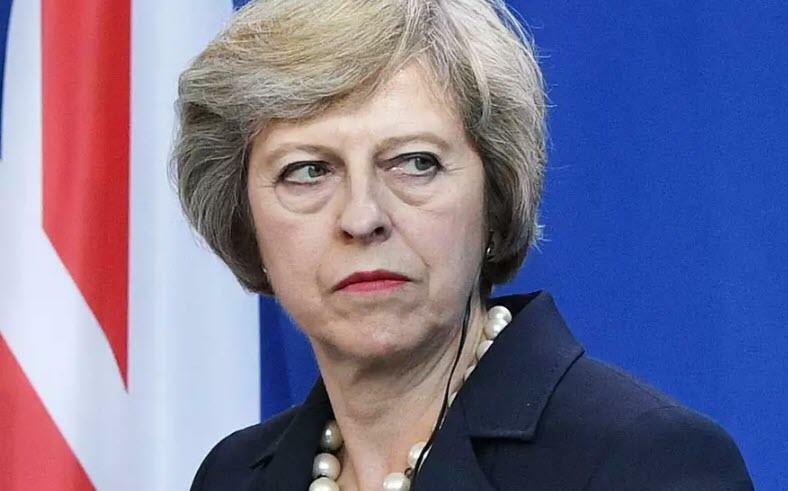 Theresa May has refused for over a week to post the legal review of the Brexit agreement she signed. Instead she posted allegedly "sufficient" excerpts on which Parliament could make a decision. According to the Guardian, the excerpts "will be sufficient information for any MP to make up their mind on the legal aspects of the deal before the upcoming five-day debate, and that it keeps to the protocol that full advice is seen as confidential between lawyer and client." Thus, Trump made an educated guess. And he guessed correctly. Because the leaked document proves May is a bald-faced liar. Here is the Complete Withdrawal Agreement leaked document. I salute the person responsible for the leak. BrexitCentral offers this assessment: Leaked Commons legal analysis of Brexit deal vindicates Trump, contradicts May and adds to Brexiteers’ concerns. The Government is already on the rack over its refusal to publish the legal advice provided on the Brexit deal by Attorney General, Geoffrey Cox, despite a parliamentary motion ordering it to be done. But ministers now face further questions as it emerges that a confidential analysis of the Withdrawal Agreement by the House of Commons’ own expert legal team comes to the same conclusion as President Trump – that Theresa May’s Brexit deal would prevent the UK from entering trade deals with countries such as the US. The bombshell is contained in a 27-page legal note prepared by the House of Commons EU Legislation Team, which is headed by Arnold Ridout, its Counsel for European Legislation. A highly respected specialist in EU Law, he has previously worked for the EC Commission’s Legal Service and advised the European Secretariat of the Cabinet Office and prior to taking up his current role in 2014, he was Deputy Legal Adviser to the House of Lords EU Select Committee. The note – marked ‘not for general distribution’ and obtained by BrexitCentral – is dated 26th November and states that the UK-EU customs union which would come into effect if the backstop is triggered “would be a practical barrier to the UK entering separate trade agreements on goods with third countries”. This is in direct contradiction to the Prime Minister who has insisted that her deal will allow the UK to have an entirely independent trade policy. The legal note also appears to suggest that the Prime Minister’s claim (also repeated last Monday) that her deal “takes back control of our laws” by ending “the jurisdiction of the European Court of Justice in the UK” with “our laws being made in our Parliament, enforced by our courts” does not entirely stand up to scrutiny. In other words, in those circumstances the UK would not be free to set levels of subsidy for UK agriculture, but the EU would remain free to adjust its Common Agricultural Policy however it liked. EU products would therefore have open access to the UK market via the customs union, while Brussels could stop us subsidising agriculture at all unless it was agreed in the Joint Committee. With that, May's lies are exposed to all in full view. Was she that stupid to think this was a good deal? Was she that stupid to think this would not be exposed? Apparently so. Never underestimate the arrogance or stupidity of politicians. This was crystal clear long ago. On November 30, I wrote Hypocrite Theresa May in Bed With the EU While Chastising the UK Parliament. This deal is such a rotten kettle of fish that even the public sees clearly sees it. What an amazing hypocrite. On November 18, I noted Opposition Mounts to Brexit Deal but France Has Still More Demands Already. 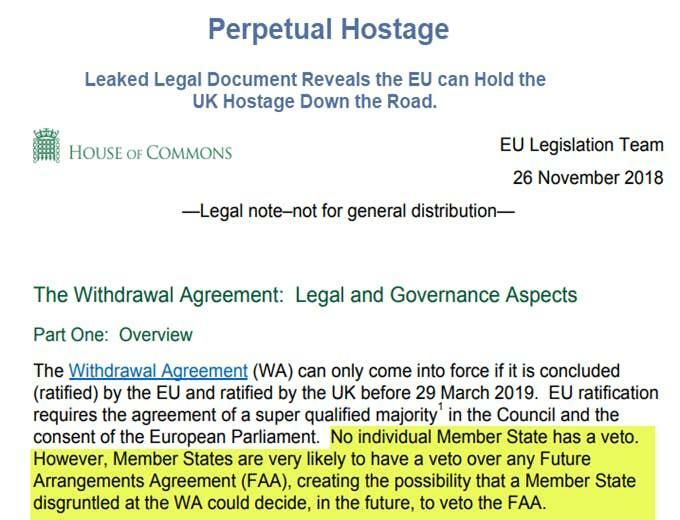 No it's not the "final deal"
The "final deal will be worse"
This interim deal keeps the UK tied with one hand behind its back until the "final" humiliation. 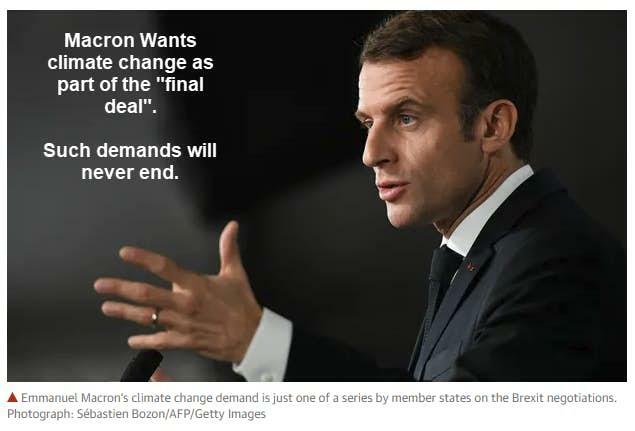 Macron added to his climate change demand, upping the ante to include fishing rights. "We as 27 have a clear position on fair competition, on fish, and on the subject of the EU's regulatory autonomy, and that forms part of our position for the future relationship talks," said Macron. Clearly, Macron understood what was in the agreement that May signed. May not only knew what she signed, she lied about it. And this was all easily predictable. The moment she refused to release the legal document, anyone with an ounce of common sense knew she was hiding something. It was even worse than I speculated. This is the political end of Theresa May. She deserves to have this agreement crammed down her throat in 100% dissent. That won't happen, but the margin should be so huge, that she resigns. Even if she does not resign, her days are numbered.